Autumn is reunion season, and the University of Oregon Alumni Association is proud to welcome back to Eugene the anniversary classes of 1958 and 1968, and to host the first-ever Black Alumni Reunion. 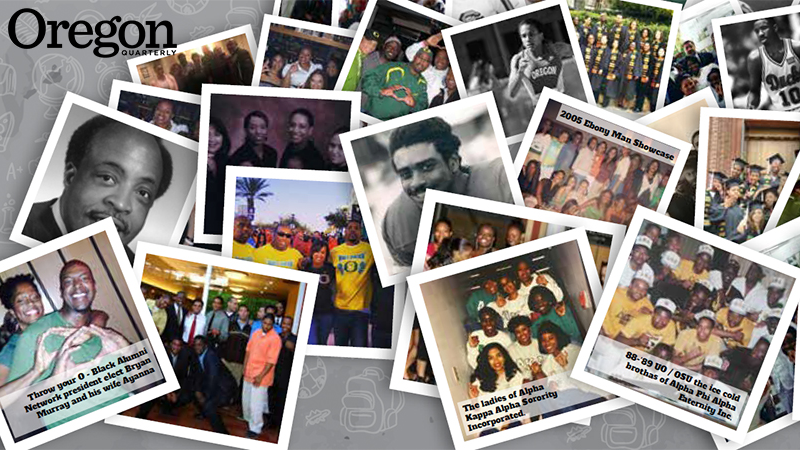 The Black Alumni Reunion is largely organized by volunteers of the UO Black Alumni Network. Chartered by the UOAA in 2016, the network is one of several “affinity” groups, a list that includes UO Pride, law and business school groups, Oregon Marching Band, and the latest, the Patos Alumni Network. In recent years, the Black Student Task Force, a campus group, has worked with President Michael Schill, administrators, students, faculty members, and staff to address issues of diversity and inclusion. Their successes include the UO African American Workshop and Lecture Series; a new academic residential community, the Umoja Pan-African Scholars; a residence hall renamed in honor of DeNorval Unthank Jr., the first African-American graduate of the College of Design; and a Black Cultural Center, slated to open in fall 2019. Concurrently, the Black Alumni Network was organizing to strengthen bonds among African-American alumni and to support students. The network raised more than $10,000 for the cultural center. Both the Black Alumni Network and the reunion are open to all alumni. The reunion, October 11–14, offers plenty for everyone: a welcome reception, campus tours, discussion panels, networking and career advice for students, an informal 5k run (or walk), and tailgating before the Ducks take on the Washington Huskies at Autzen Stadium. The reunion will conclude in rousing fashion with the “Soul Sunday Brunch,” featuring conductor John Gainer and the UO Gospel Ensemble Reunion Choir. In 1958, NASA was founded, the microchip was invented, and Elvis Presley joined the US Army. But when members of the Class of ’58 gather October 5–6 and reminisce, they’re more likely to share memories of a near-miracle, three-point loss to Ohio State in the Rose Bowl, or a visit by Charles Schultz, famed creator of “Peanuts,” who drew a special comic for the Emerald that featured Linus with an “O” on his blanket. Activities for the 60th reunion include tours of athletics facilities, the Erb Memorial Union (dramatically remodeled since its 1958 heyday), and the Lorry I. Lokey Laboratories. A luncheon panel discussion on student life hosts speakers Merle Weiner, Philip H. Knight professor of law and faculty director of the law school’s Domestic Violence Clinic; Darci Heroy, associate vice president for the Division of Student Life and Title IX coordinator; and Kasia Mlynski, staff attorney in the Domestic Violence Clinic. In 1968—just 10 years after NASA was founded—Apollo 8 orbited the moon, and the Class of ’68 launched into life after college. The 50th reunion, November 1-3, includes a presentation from the Knight Campus, campus tours, a lunch lecture from Roger Thompson, vice president for Student Services and Enrollment Management, and a tailgate party prior to the Oregon vs. UCLA football game.